I am fortunate to be living in Dubai and able to experience all that it has to offer from the sights, sounds to the diverse cultures that move through the city daily. It’s truly amazing to see how a city has evolved from the desert and now showcases the best that the world has to offer. Dubai has a plethora of taxi’s available to you on ever corner, mall and on a busy night they are a call away. One tip I can share with you is that road names are there but no one knows them, if you want to get around direct your driver to the building name or the nearest landmark store and you will arrive at your destination without an issue. Tying in with the lifestyle that Dubai offers of convenience there is either an app or website available 24 hours a day for you to order anything that your heart may desire, from taxi’s to groceries to a post party maid cleaning service so you don’t have to face the aftermath of entertaining the next morning. Dubai is a place filled with many people from many different backgrounds, beliefs and heritages. Living here you learn that it’s all about respect, respect for people, their property and for what they do. It’s an inspiration to see how people live in harmony amongst such diversity. Also there are rules and regulations, don’t go against them, they are there for a reason and will be enforced, go about your normal day and you will not have any issues. Looking for a place to live in Dubai is a tricky one because you have to pay your rent upfront for the year, which means its either the full amount, or 2-4 post dated cheques to cover the expense. When coming here chat to your company about helping you pay for the initial rental (and you pay the company back monthly) and use a rental agent. The agents know the areas, are able to facilitate all the paperwork and give you piece of mind when signing a contract for such a long period. Once your bank account is set up and running, beware there is no credit control in place as yet and the banks will offer you exorbitant amounts of credit. You are living in Dubai earning a tax-free salary; don’t get sucked into the allure of credit to sustain a lavish lifestyle. 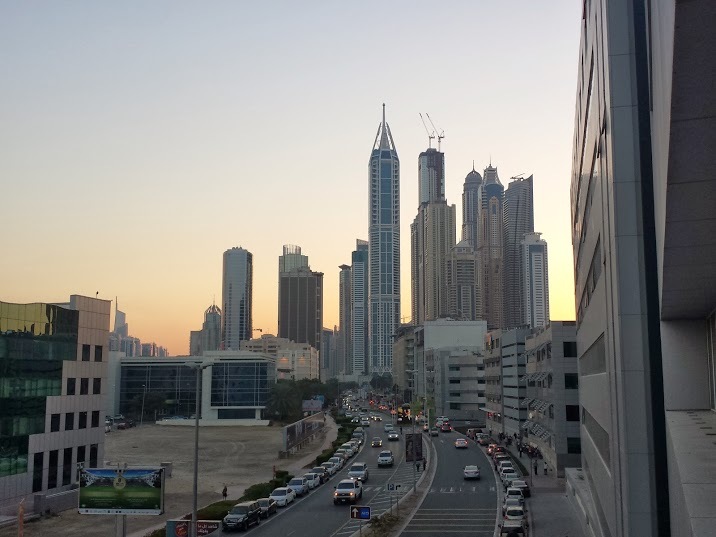 Dubai is an engine, it’s always on and running at full speed, and when you move here you will see how people work, not only do they work hard but also they work long hours. This is not because there is a lack of resources but because of the work ethic that comes with a city that thrives on being connected to the rest of the world across many time zones. While the city prides itself on being so forward in all aspects, official processes for visa’s, banking, etc. do take some time and rely heavily on having plenty supporting documentation. Don’t try and rush the process follow the guidelines and submit all the necessary documentation and the application will go through in time. If you love driving, as I do, you are probably going to want to get a car of your own. There are two options here, buy a car through your financial institution or do a long-term rental. The rental option is the best it allows you to have a vehicle of your own but you do not have to worry about maintenance and insurance on the vehicle for the period of your lease, also the headache of having to sell a car is no longer there if you want to leave as you just hand the car back to the company. And here I am not kidding, when you think of Dubai you know it’s going to be hot but summer is a scorcher and the humidity makes it even worse. Everything is air-conditioned, even the bus stops but it is still extremely hot and whether you think its gross you will sweat. Just drink lots of water and if you plan well enough take your vacation during the summer months. The rest of the year the weather is amazing bordering on 22 degrees, which is chilly for this city. Moving to Dubai you have the world at your doorstep, with most destinations being a couple hours away and airlines such as Fly Dubai you have no excuse to stay in Dubai for the weekend. Get out and go explore! There are a thousand little tips and tricks that you learn as you live here but these are the ones that I know would have prepared me for this exciting journey. Dubai is home for me, only a couple months in and I fall in love with it again each day. If you’re ever in town let me know would be great to show you around! Thank you for your kind words Ace, you should come and visit sometime and see the place for yourself! Excellent post Mitch, I have never thought to live in Dubai but I do love the photos and wallpaper designs to save to my desktop to keep me inspired of such beauty in the Dubai architecture and lifestyle others are continuing to enjoy.